Fireboat elevating and rotating tower. 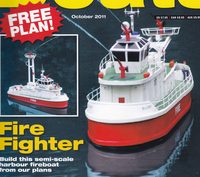 I previously mentioned that looking around for a new project I acquired Glyn Guest's Elliot Fireboat plans. 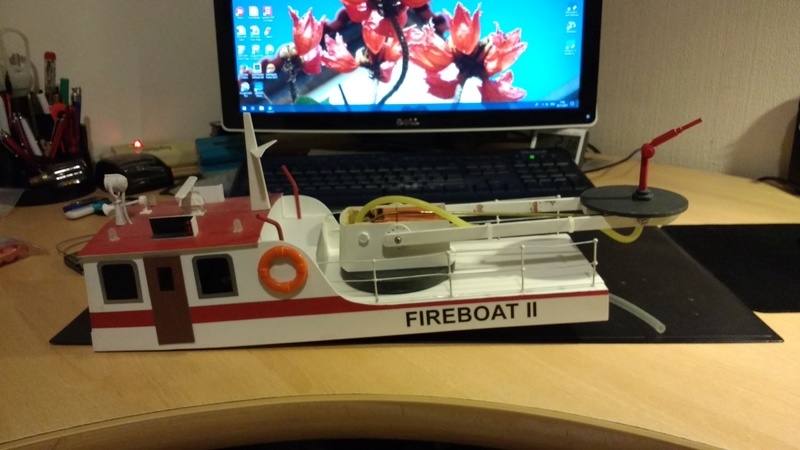 I wasn't too keen on the design of the ship, but saw the elevating and rotating tower as a suitable challenge which I plan to add to my existing fireboat. The added bonus of this plan is that I do not increase my fleet which is already too extensive. Just to remind you, this is what the model looks like now. and this is Elliot with the tower. It's the challenges that keep us going Barrie. another cracker , matey.just love your boats. The first job was to remove the fittings from the deck, plus the rear railings. The deck was only 1 mm plastic card, so to strengthen it I added some 1.5 mm. 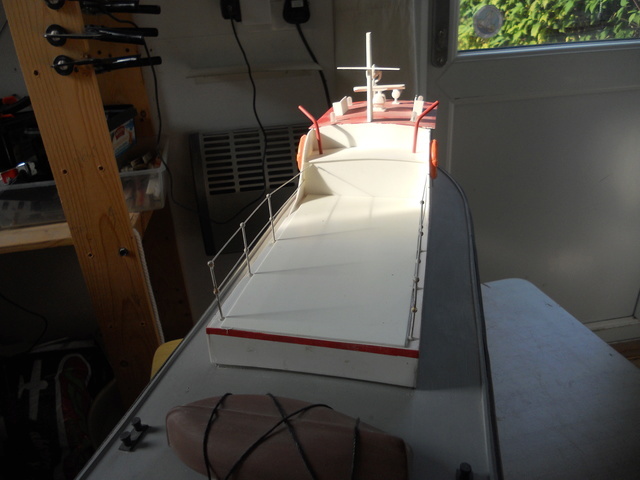 It may require additional stiffeners under the deck - I'll see how it is when everything is finished. 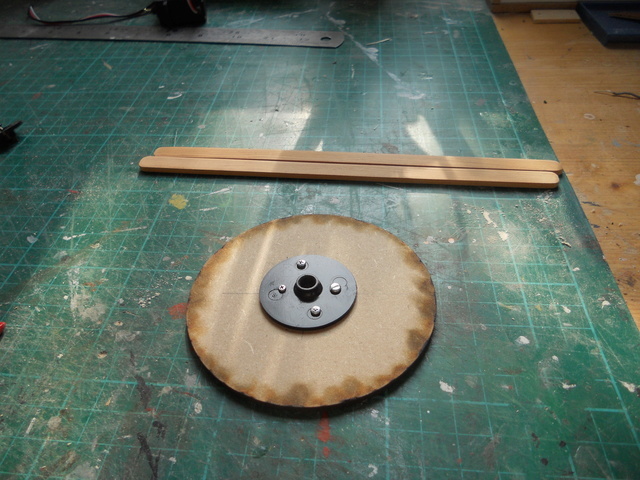 Next job was to mark the centre of one of the larger discs and then fix a servo wheel to it. Eventually I will create a 'skirt' to hide the servo head. This will probably be another 90 mm circle with its centre cut out. The arms for the tower will be made from timber - GG used plastic I beams, but I couldn't find any big enough. Next up was cutting a hole in the deck to take the rotate servo. This was then fixed to give the necessary clearance for the rotating platform. 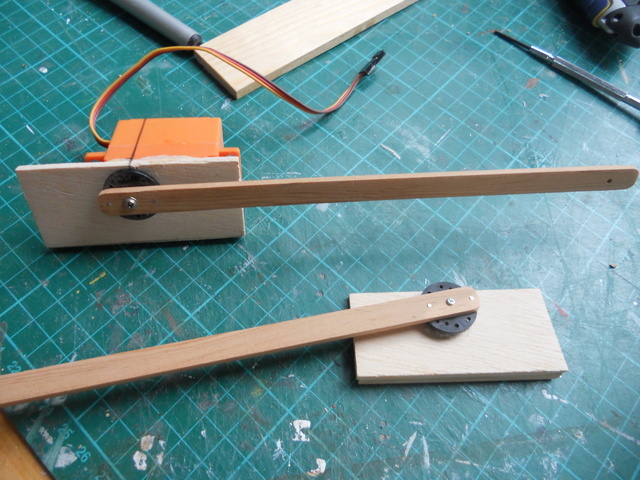 I have also been working on the lifting servo. Two cheeks have been cut from liteply. The servo will be glued between these, and these then glued to the rotating platform. I should have posted this photo yesterday - the servo mounted in the deck. 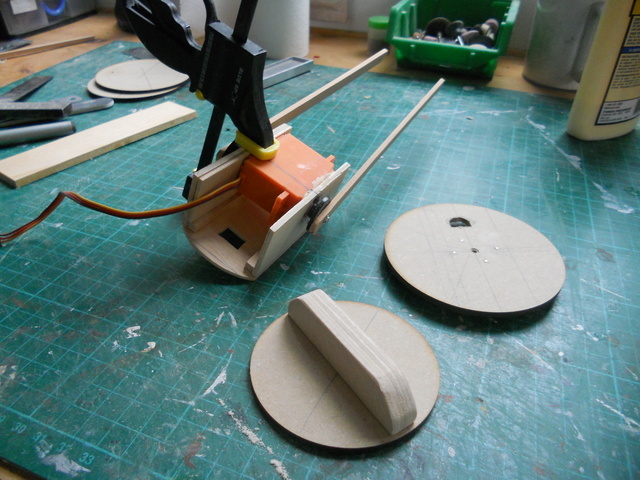 The arms have now been fitted to the servo and a dummy pivot. I was about to fix the two sides to the turntable when I realised that if I just stuck them down I would not be able to fix the turntable to the servo, or remove it . So I made a mounting plate from some liteply which I will screw to the turntable. The two sides are now glued to the plate. I have also cut the strengthener for the operating platform. The arms will be fixed to this. Back to the modelling. I made good progress today and have the basic functions working The first video shows the tower going up and down controlled by a servo tester. As you can see, its a little jerky - not sure if the servo is at fault, or the tester. It also appears in this that the platform is not level when in the down position. I will have to check this as it appeared OK to me before I did the video. 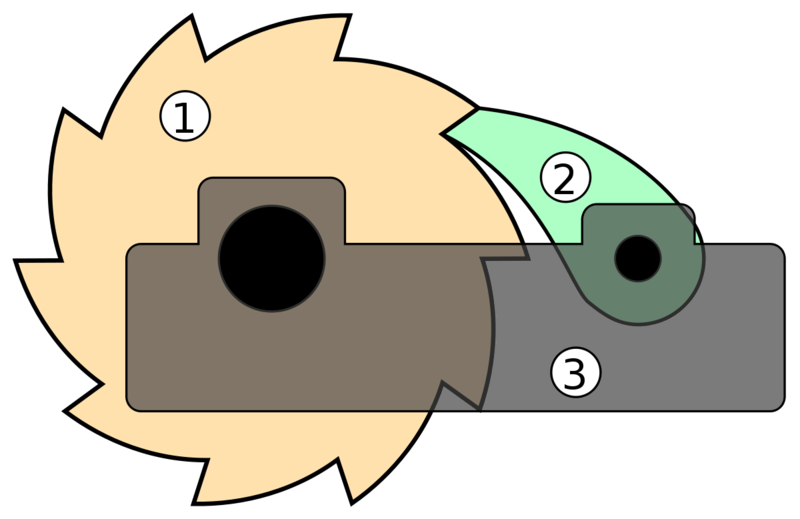 The second video show the turntable. Next job is to test with the Tx/Rx to check out that servo and then need to add some cladding to the servo platform and apply some paint. Once I am happy I will start on the controller which will ensure that the tower is not rotated until it will clear the railings, and also that it is not lowered until is in the correct position. The servo is OK - I tested this morning. However, there is something wrong with the geometry as it doesn't look right. I started trying to sort it out but I have somehow damaged my left wrist and had to give up. Hopefully its nothing serious and I will be able to get back to solving the problem soon. fascinating and ingenious work barrie. love it. Sorry about your wrist Barrie. The engineering is coming on nicely. Thanks for the good wishes! I'm not sure what that was all about! Yesterday morning I could hardly bear to move my wrist. I strapped it up and tried not to use it all day. This morning its fine - no more discomfort than normal. So back to the tower! I have now sorted out the geometry and it works pretty well most of the time. The platform does occasionally stick leaving the horizontal. If it continues I think some weight on the outer edge may fix this problem. The problem may be caused by me using brass for the second leg which is not quite stiff enough. I am now trying to work out the sequence for completing things. I need to clad the elevating servo to make it look neater, and also fix it to the turntable. If I completely clad it, I won't be able to fix with screws as I plan to do. I did some painting yesterday, today I made another fire monitor. 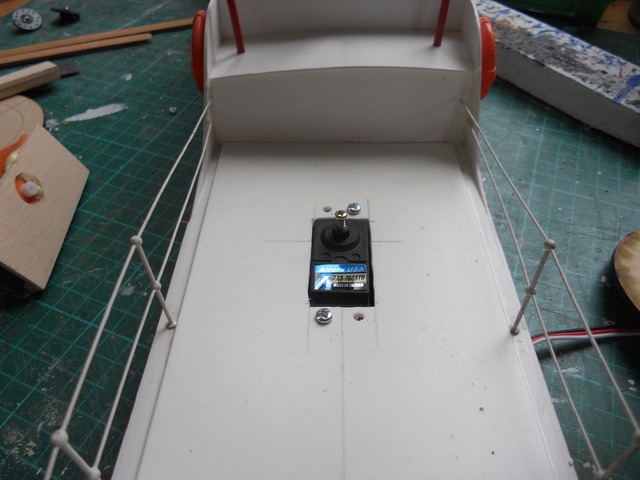 I have also clad the elevating servo in plastic card. 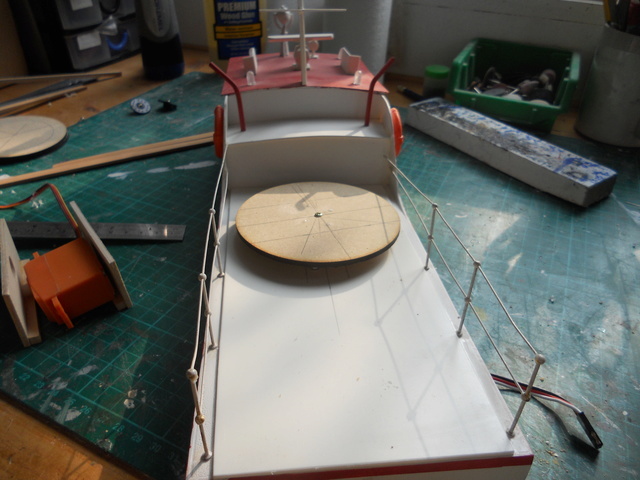 The railings round the upper deck were never very good, so I have added one more stanchion on each side. They are not quite identical, but look OK. I have also finished the basic routines for the Arduino to control both servos and slow them down to a more realistic operating speed. I will be trying to enhance this so that you can't rotate until clear of the railings, and can't lower unless the turntable is central. I did some more painting yesterday and hope to re-assemble the bits today. I have 'acquired' some thicker and stiffer brass rod which I think will be more rigid and make for smoother operation of the platform. Here is a test without any computer processing. Rather jerky - partly because the superstructure is not on the boat, but not very good and limited movement. This is via the Arduino processing. Still some problems to resolve, but I think it will work. Notice the increased range of movement and also much smoother and slower. The tubing is still causing some problems and the program needs adjusting to get the correct movements and limits. Yes - I thought this was silicone, and more flexible than the clear stuff I started with, but I think I will try some of the silicone. I watched your You Tube films and wondered if the speed could slowed down. This might eliminate the jerkiness effect. ? 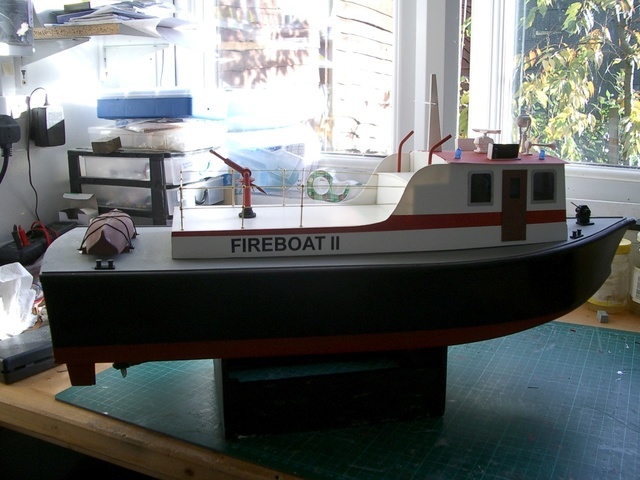 I am building my second Seabex 1 at the moment which also has fire pumps and crane, so your topic is of great interest. I'm thinking of Arduino as well. so a few hints on the programming would be appreciated. 3 - as you say the speed. It is possible to slow this down further. So far I have tested using a Uno development system and breadboard. I have now built the circuit onto some stripboard which means I can test away from the office. I'll let you know how I get on. Once complete I am happy to post the Arduino sketch on here, although its actually quite simple at the moment. I may enhance it to put in some safety checks. This project has come to a stop I am having problems with the controller. It works perfectly on the breadboard, but when I made a dedicated circuit for it I ran into problems - nothing works I've checked and re-checked the circuit and can't see anything wrong, so I need to try and build a new one. Just waiting for parts to arrive. Well - I finally got the controller board to work with micro servos, but when I attach it to the model the servos just vibrate. It all worked from the breadboard, so not sure what's wrong. I have coupled everything up without the controller and will hopefully test it on Sunday - if the lake isn't frozen. It looks as though the servos are taking too much power The motor wouldn't run when the tower was elevated and rotated. It would appear that I need a second power source for the two servos operating the tower. After some experimentation today, I have made some changes. The controller board is now powered from the drive battery via the esc and receiver. The two servos have their own 6 volts supply from 5 x 1.2 volt NiMh batteries. 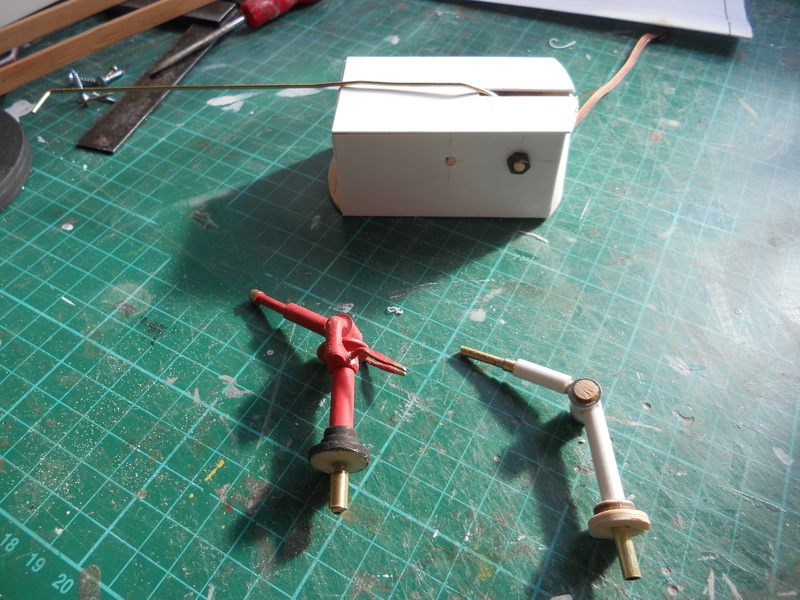 When I get some servo extension leads I will be able to finalise the installation and maybe re-test next Sunday. I have a servo power meter on order which will allow me to see how much power those two full size servos actually use. I normally use micro servos for steering which are not a problem power wise. This si the final version - still not as smooth as I would like, but you get the idea! Coming along nicely Barrie always little bugs to iron out. Further problems this morning Not sure of the cause, but I suspect its still power related. When sailing with the tower elevated, the tower would suddenly dip and then return. My Tx, which monitors Rx voltage, would beep at the same time, which is what leads me to think it was power and the Rx losing contact with the Tx. It was pretty cold this morning, so maybe the NiMh batteries were not delivering full power. I think I will try with a 7.4 volt LiPo instead of the 6 volt NiMh. Having finished the Shrimp Boat, pending sea trials, I took this down off the shelf intending to sort out the dither with the tower. Firstly I removed the micro-controller and connected the servos direct the the Rx. And it still wouldn't hold still at the horizontal. I suspected the servo and so decided to remove it from the housing. This wasn't easy as it was glued in . However it did come out without too much damage. Testing it without anything fixed to it it felt quite rough so I decided to buy a new servo. I think the problem is that the servo hasn't enough torque to hold the load, and so it keeps searching for the balance point. Maybe a heavy duty servo with a greater torque would work, BUT they are bigger and more expensive .... so I have decided on Plan B. More later when I have decided designed and built the tower. Is there any way you could add a ratchet lock to the mechanism? This would allow the arm to remain locked and steady in any position it’s set to, for the return you would also need to add a way to unlock the ratchet, but im Confident this could be a solution without the need for a bigger servo. Attached photo is what I had in mind if that helps my description. Thanks for the suggestion. I have no doubt such an arrangement would work - if there was room in the housing to mount another servo or a solenoid. However, this was only a fun project to get more use out of a boat I don't often sail and an opportunity to use the Arduino controller. I will continue with my plan for a tower - firefighting tugs usually have their monitors on a high platform, so this will be similar. Subject: Re: Fireboat elevating and rotating tower.